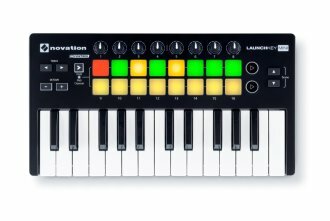 Launchkey Mini is perfect for sketching out ideas in Ableton Live using its 25-note mini keyboard. 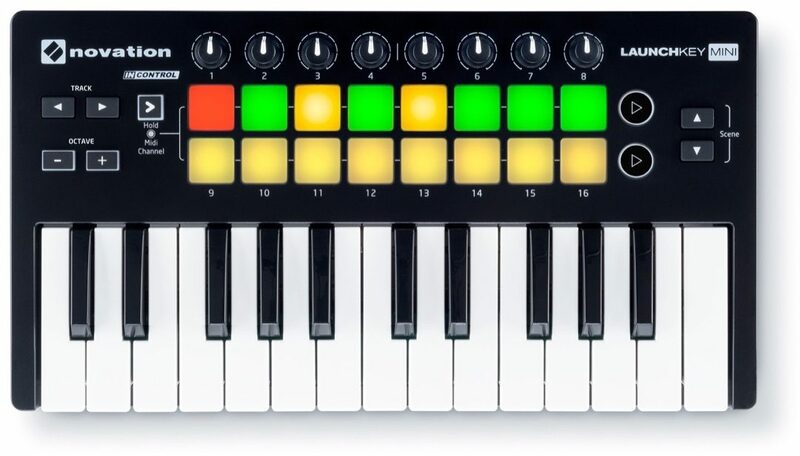 Trigger loops and perform expressive drum beats with 16 velocity-sensitive multi-colored pads. Tweak your instruments and effects using the eight knobs. Launchkey Mini will work the moment you plug it into your laptop via USB, or your iPad via Camera Connection Kit. It integrates immediately with Ableton Live or any other major music software, and comes with everything you need to start making music, including Ableton Live Lite. 16 velocity-sensitive multi-colored pads for triggering clips and playing drums. Launchkey Mini is class compliant, so will work with any modern Mac, Windows or Linux PC. For further information see the Novation web site.